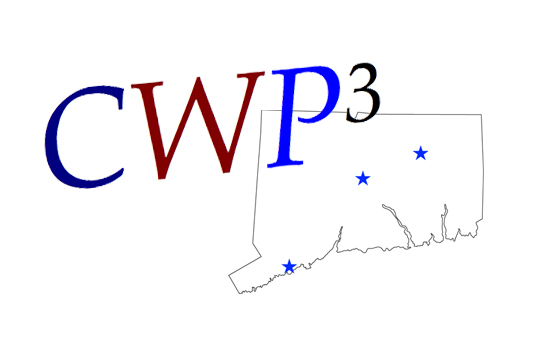 The CWP3 is a state network of the three Connecticut Writing Projects that are located at the University of Connecticut, Central Connecticut State University and Fairfield University. Currently, the directors of the three NWP sites in Conecticut work together as a State Network. In 2009, the CWP-Fairfield received a State Network Minigrant, and with it the three sites held a successful Professional Writing Retreat in June. Participating teachers produced an anthology, Empowering Students as Readers and Writers, based upon the National Writing Project's model. Additionally, for the last three years the site directors have been meeting monthly, and informal collaboration has been ongoing. They have shared TCs for professional development in schools, and as a network they co-sponsored and co-funded two conferences in the Fall of 2008, one at Central Connecticut State University featuring Sheridan Blau, and one at Fairfield University featuring Jeffrey Wilhelm. All three schools have received funding from the National Writing Project through the SEED Supporting Effective Educator Development (SEED) initiative. The CWP at UConn was awarded one grant to promote Teacher Leadership and a second to provide Professional Development in a High-Need School. The Central Connecticut Writing Project also received a Teacher Leadership grant. The CWP at Fairfield University was awarded both a Teacher Leadership and a High-Need School grant. This grant was only awarded to 75 schools nationally. The CWP at Central is using their SEED funding to work closely with Slade Middle School on improving education through technology. They are working towards becoming a paperless classroom by utilizing wiki sites and google docs. They have found that through technology, students become more engaged. The use of visual aids helps them better remember the lessons and projects they complete in the classroom. Technology has also allowed them to improve motivation, creativity, and vocabulary. The Fairfield branch of the CWP has used their funding to assist students at Bassick High School. Director Bryan Crandall has worked closely with the school to promote literacy in every way possible, including creating assignments for students to complete during in-school suspension. Of his experience Dr. Crandall states, “What I am learning is that, as a nation, we need greater investments from State and National government to promote professional development initiatives district-wide. Teachers want to improve practice and depend on district support.” Fairfield has also used some of their SEED funding to offer funding for Literacy Enhancement Projects. The Directors of these three sites also received an award in May, 2012 through the New England Reading Association for their outstanding performance.